PM Modi’s pet bullet train project between Mumbai and Ahmedabad to be operational in 2022 may never materialize as by then BJP/RSS may not be ruling India and hopefully national priorities would change for more earthly causes. ‘Achche-din’ promised by Modi immediately after taking over as PM in 2014 may be decades away, however, the Hindutva juggernaut under the present BJP/RSS rulers is running amok despite India still being committed to a democratic-secular polity. Ironically, the Hindutva rulers who took oath to remain faithful to the democratic-secular Constitution of India continue indulging in nefarious anti-national activities crossing all limits. In fact, there seems to be a competition going on amongst them that who would inflict the maximum damage to the present constitutional polity of India. The latest character from this Hindutva demolition squad to decry and denigrate Indian constitutional polity is Anantkumar Hegde, blue-eyed boy both of RSS and PM Modi and a minister in latter’s cabinet. Hegde who learnt Hindutva tricks of polarization while threatening to convert the Guru Dattatreya Baba Budan Dargah in the Baba Budan Giri range of Chickmagalur into the ‘Ayodhya of the South’ declared war on the Indian Constitution. It is to be noted that he was made a central minister despite the fact that he was caught on camera hitting a doctor, grabbing him by the throat and slamming him against a wall. Hegde was furious because he felt the doctors were not paying enough attention to his mother, who had suffered multiple fractures after a fall at home. He also gave a call for uprooting Islam. This Hindutva champion while addressing a public meeting (December 24, 2017) organised by the Brahman Yuva Parishad in Koppal district of Karnataka declared that the BJP had come to power to “change the Constitution” which it would do in the “near future”. He was immensely scornful of the principle of secularism. According to him secularists were “people without parentage or who don’t know their bloodline. They don’t know themselves. They don’t know their parents, but they call themselves secular. If someone says I am secular, I get suspicious. I hope there are no secularists here”. While denigrating secularists he brought in the issue of their parenthood, declaring the former as illegitimate children. Thus he not only spread canard against the present upholders of democratic-secular India but also denigrated great leaders like Bhagat Singh, Chandershekhar Azad, Ashfaqullah Khan, MK Gandhi, Rabindranath Tagore, Sardar Patel, Dr BR Ambedkar, Abul Kalam Azad, Subhashchander Bose, Jawahar Lal Nehru who lived and died for an all-inclusive India. He made it clear that though word secular was part of Indian Constitution but “this will change in the near future”. India of Hegde could not be an all-inclusive India but where people would identify themselves as per the religions they professed. Hegde stressed that “if someone says I am a Muslim, or I am a Christian, or I am a Lingayat, or I am a Hindu, I feel very happy because he knows his roots”. According to Hegde’s take there are no Indians but Hindus, Muslims, Christians and so on. Thus Hegde presented himself as a votary of religious based identity of Indians like the Muslim League. It is shocking that a central minister is brazenly declaring his and his BJP/RSS government’s plan to undo democratic-secular India. 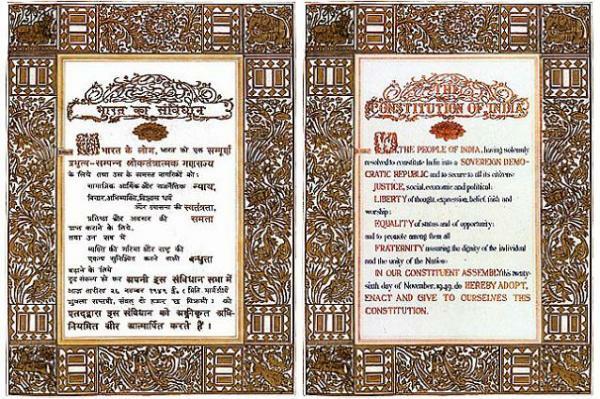 It is anti-national declaration, betrayal of the ideals of the freedom struggle, sabotage of the wisdom of the Constituent Assembly of India and open defiance of dozens of decisions of the Supreme Court in which highest court of justice decreed secularism and democracy as ‘basic features’ of the Indian polity. The Supreme Court of India must take a suo motu cognizance of Hegde’s crime and order filing of a case against him for planning subversion of the Indian polity. Moreover, President of the Indian Republic, a Dalit icon, must order the removal of Hegde from the Modi government and order his punishment for anti-national call. Sadly, with ministers like Anantkumar Hegde around, no foreign enemy is required to destroy democratic-secular India. It is high time that custodians of Indian polity should take stern action against this subversion from within. At least now, people – especially OBCs, dalits, muslims and marginalised sections – should realise the true colours of the right wing hindutva forces.. They are appropriating Ambedkar to woo the weaker sections and ‘ backstab ‘ them at the opportune moment. They are trying to eliminate Ambedkarism by chanting ‘ Ambedkar’ ‘ !! This is dangerous ..